Cattle are considered sacred in world religions such as Hinduism, Jainism, Buddhism, Zoroastrianism, and others. Cattle played other major roles in many religions, including those of ancient Egypt, ancient Greece, ancient Israel, ancient Rome, and ancient Germany. Legislation against cattle slaughter is in place throughout most states of India except Kerala, West Bengal, and parts of the North-East. The majority of scholars explain the veneration for cows among Hindus in economic terms, including the importance of dairy in the diet, the use of cow dung as fuel and fertilizer, and the importance that cattle have historically played in agriculture. Ancient texts such as Rig Veda, Puranas highlight the importance of cattle. The scope, extent and status of cows throughout ancient India is a subject of debate. According to D. N. Jha, cattle, including cows, were neither inviolable nor as revered in ancient times as they were later. A Gryhasutra recommends that beef be eaten by the mourners after a funeral ceremony as a ritual rite of passage. In contrast, according to Marvin Harris, the Vedic literature is contradictory, with some suggesting ritual slaughter and meat consumption, while others suggesting a taboo on meat eating. The Chandogya Upanishad (~ 800 BCE) mentions the ethical value of Ahimsa, or non-violence towards all beings. By mid 1st millennium BCE, all three major Indian religions – Buddhism, Hinduism, and Jainism were championing non-violence as an ethical value, and something that impacted one's rebirth. According to Harris, by about 200 CE, food and feasting on animal slaughter were widely considered as a form of violence against life forms, and became a religious and social taboo. Dairy cows are called aghnya "that which may not be slaughtered" in Rigveda. Yaska, the early commentator of the Rigveda, gives nine names for cow, the first being "aghnya". The calf is compared with the dawn, in Hinduism. Here, with a sadhu. 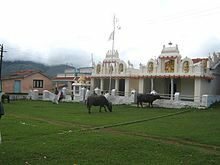 According to Nanditha Krishna, the cow veneration in ancient India during the Vedic era, the religious texts written during this period called for non-violence towards all bipeds and quadrupeds, and often equated killing of a cow with the killing of a human being specifically a Brahmin. Nanditha Krishna stated that the hymn 8.3.25 of the Hindu scripture Atharvaveda (~1200–1500 BCE) condemns all killings of men, cattle, and horses, and prays to god Agni to punish those who kill. Many ancient and medieval Hindu texts debate the rationale for a voluntary stop to cow slaughter and the pursuit of vegetarianism as a part of a general abstention from violence against others and all killing of animals. According to Harris, the literature relating to cow veneration became common in 1st millennium CE, and by about 1000 CE vegetarianism, along with a taboo against beef, became a well accepted mainstream Hindu tradition. This practice was inspired by the beliefs in Hinduism that a soul is present in all living beings, life in all its forms is interconnected, and non-violence towards all creatures is the highest ethical value. Vegetarianism is a part of the Hindu culture. The god Krishna and his Yadav kinsmen are associated with cows, adding to its endearment. According to Ludwig Alsdorf, "Indian vegetarianism is unequivocally based on ahimsa (non-violence)" as evidenced by ancient smritis and other ancient texts of Hinduism. He adds that the endearment and respect for cattle in Hinduism is more than a commitment to vegetarianism and has become integral to its theology. The respect for cattle is widespread but not universal. According to Christopher Fuller, animal sacrifices have been rare among the Hindus outside a few eastern states. To the majority of modern Indians, states Alsdorf, respect for cattle and disrespect for slaughter is a part of their ethos and there is "no ahimsa without renunciation of meat consumption". The reverence for the cow played a role in the Indian Rebellion of 1857 against the British East India Company. Hindu and Muslim sepoys in the army of the East India Company came to believe that their paper cartridges, which held a measured amount of gunpowder, were greased with cow and pig fat. The consumption of swine is forbidden in Islam and Judaism. Because loading the gun required biting off the end of the paper cartridge, they concluded that the British were forcing them to break edicts of their religion. The texts of Buddhism state ahimsa to be one of five ethical precepts, which requires a practicing Buddhist to "refrain from killing living beings". Slaughtering cow has been a taboo, with some texts suggest taking care of a cow is a means of taking care of "all living beings". Cattle are seen in some Buddhist sects as a form of reborn human beings in the endless rebirth cycles in samsara, protecting animal life and being kind to cattle and other animals is good karma. Not only do some, mainly Mahayana, Buddhist texts state that killing or eating meat is wrong, it urges Buddhist laypersons to not operate slaughterhouses, nor trade in meat. Indian Buddhist texts encourage a plant-based diet. The term geush urva means "the spirit of the cow" and is interpreted as the soul of the earth. In the Ahunavaiti Gatha, Zarathustra (or Zoroaster) accuses some of his co-religionists of abusing the cow. Ahura Mazda tells Zarathustra to protect the cow. The lands of Zarathustra and the Vedic priests were those of cattle breeders. The 9th chapter of the Vendidad of the Avesta expounds the purificatory power of gōmēz – cow urine. It is declared to be a panacea for all bodily and moral evils, understood as which it features prominently in the 9-night purification ritual Barashnûm. According to the Hebrew Bible, an unblemished red cow was an important part of ancient Jewish rituals. The cow was sacrificed and burned in a precise ritual, and the ashes were added to water used in the ritual purification of a person who had come in to contact with a human corpse. The ritual is described in the Book of Numbers in Chapter 19, verses 1–14. Some Jews committed to Jewish vegetarianism believe that Jews should refrain from slaughtering animals altogether and have condemned widespread cruelty towards cattle on factory farms. Islam allows the slaughter of cows and consumption of beef, as long as the cow is slaughtered in a religious ritual called dhabīḥah or zabiha similar to the Jewish shechita. The second and longest surah of the Quran is named Al-Baqara ("The Cow"). Out of the 286 verses of the surah, 7 mention cows (Al Baqarah 67–73). The name of the surah derives from this passage in which Moses orders his people to sacrifice a cow in order to resurrect a man murdered by an unknown person. Per the passage, the "Children of Israel" quibbled over what kind of cow was meant when the sacrifice was ordered. Classical Sunni and Shia commentators recount several variants of this tale. Per some of the commentators though any cow would have been acceptable but after they "created hardships for themselves" and the cow was finally specified, it was necessary to obtain it any cost. In ancient Egyptian religion, bulls symbolized strength and male sexuality and were linked with aggressive deities such as Montu and virile deities such as Min. Some Egyptian cities kept sacred bulls that were said to be incarnations of divine powers, including the Mnevis bull, Buchis bull, and the Apis bull, which was regarded as a manifestation of the god Ptah and was the most important sacred animal in Egypt. Cows were connected with fertility and motherhood. One of several ancient Egyptian creation myths said that a cow goddess, Mehet-Weret, who represented the primeval waters that existed before creation, gave birth to the sun at the beginning of time. The sky was sometimes envisioned as a goddess in the form of a cow, and several goddesses, including Hathor, Nut, and Neith, were equated with this celestial cow. The Egyptians did not regard cattle as uniformly positive. Wild bulls, regarded as symbols of the forces of chaos, could be hunted and ritually killed. 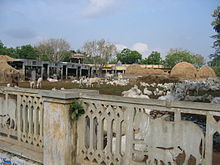 A cow shelter (goshala) at Guntur, India. A cow walking in Delhi. Gopastami, a holiday celebrated by the Hindus once a year, is one of the few instances where cows receive prayers in modern-day India. While the cow is still respected and honored by most of the Indian population, there has been controversy over the treatment of the cows during the holiday. The beef taboo is fairly widespread in Myanmar, particularly in the Buddhist community. In Myanmar, beef is typically obtained from cattle that are slaughtered at the end of their working lives (16 years of age) or from sick animals. Cattle is rarely raised for meat; 58% of cattle in the country is used for draught animal power (DAP). Few people eat beef, and there is a general dislike of beef (especially among the Bamar and Burmese Chinese), although it is more commonly eaten in regional cuisines, particularly those of ethnic minorities like the Kachin. Buddhists, when giving up meat during the Buddhist (Vassa) or Uposatha days, will forego beef first. Almost all butchers are Muslim because of the Buddhist doctrine of ahimsa (no harm). Historically, there was a beef taboo in Ancient Japan, as a means of protecting the livestock population and due to Buddhist influence. Meat-eating had long been taboo in Japan, beginning with a decree in 675 that banned the consumption of cattle, horses, dogs, monkeys, and chickens, influenced by the Buddhist prohibition of killing. In 1612, the shōgun declared a decree that specifically banned the killing of cattle. ^ The protection of cattle and prevention of cattle slaughter is not limited to Buddhists in India, but found in other Theravada countries such as Sri Lanka, Myanmar and others. ^ "The states where cow slaughter is legal in India". The Indian Express. 8 October 2015. Retrieved 24 August 2018. ^ Tähtinen, Unto (1976), Ahimsa. Non-Violence in Indian Tradition, London: Rider, ISBN 978-0091233402, pp. 1-6, 107-109. ^ a b c d Lisa Kemmerer (2011). Animals and World Religions. Oxford University Press. pp. 59–68 (Hinduism), pp. 100–110 (Buddhism). ISBN 978-0-19-979076-0. ^ Forever, Cows. "12 Fun Facts About Cattles". 5amily. Retrieved 15 April 2019. ^ ऋग्वेद: सूक्तं १०.८७, Wikisource, Quote: "यः पौरुषेयेण क्रविषा समङ्क्ते यो अश्व्येन पशुना यातुधानः । यो अघ्न्याया भरति क्षीरमग्ने तेषां शीर्षाणि हरसापि वृश्च ॥१६॥"
^ a b c Alsdorf, Ludwig (2010). 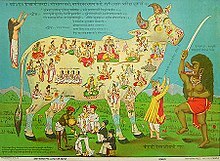 The History of Vegetarianism and Cow-Veneration in India. Routledge. pp. 2–4. ISBN 978-11351-66-410. ^ Biardeau, Madeleine (1993). "Kamadhenu: The Mythical Cow, Symbol of Prosperity". In Yves Bonnefoy (ed.). Asian mythologies. University of Chicago Press. p. 99. ISBN 0-226-06456-5. ^ "Report of the National Commission on Cattle – Chapter II (10 A. Cow Protection in pre-Independence India)". DAHD. Archived from the original on 9 November 2013. Retrieved 8 November 2013. ^ a b "Compilation of Gandhi's views on Cow Protection". Dahd.nic.in. 7 July 1927. Archived from the original on 25 November 2011. Retrieved 13 November 2011. ^ a b Lisa Kemmerer; Anthony J. Nocella (2011). Call to Compassion: Reflections on Animal Advocacy from the World's Religions. New York: Booklight. pp. 57–60. ISBN 978-1-59056-281-9. ^ a b Lisa Kemmerer (2011). Animals and World Religions. Oxford University Press. pp. 100–101, 110. ISBN 978-0-19-979076-0. ^ a b H. Saddhatissa (2013). The Sutta-Nipata: A New Translation from the Pali Canon. Routledge. p. 33. ISBN 978-1-136-77293-1. ^ a b Richard Gombrich (2012). Buddhist Precept & Practice. Routledge. pp. 303–307. ISBN 978-1-136-15623-6. ^ Carmichael, Calum (2012). The Book of Numbers: A Critique of Genesis. New Haven, Connecticut: Yale University Press. pp. 103–121. ISBN 9780300179187. ^ "Apocalypse Cow". The New York Times. 30 March 1997. Retrieved 21 December 2013. ^ Hersh, June (2011). The Kosher Carnivore: The Ultimate Meat and Poultry Cookbook. Macmillan Publishers. pp. 19–21. ISBN 9781429987783. ^ Goldman, Ari L. (2007). Being Jewish: The Spiritual and Cultural Practice of Judaism Today. Simon & Schuster. p. 234. ISBN 9781416536024. ^ "Rabbinic Statement". Jewish Veg. Retrieved 16 October 2017. ^ Nussbaum, Martha Craven. The Clash Within: Democracy, Religious Violence, and India's Future. p. 224. ^ Diane Morgan (2010). "Essential Islam: A Comprehensive Guide to Belief and Practice". ABC-CLIO. p. 27. ISBN 9780313360251. ^ Thomas Hughes (1995) [first published in 1885]. "Dictionary of Islam". Asian Educational Services. p. 364. ISBN 9788120606722. ^ Avinoam Shalem (2013). "Constructing the Image of Muhammad in Europe". Walter de Gruyter. p. 127. ISBN 9783110300864. ^ Rosalind Ward Gwynne (2014). "Logic, Rhetoric and Legal Reasoning in the Qur'an: God's Arguments". Routledge. p. 38. ISBN 9781134344994. ^ Mahmoud M. Ayoub (1984). "The Qur'an and Its Interpreters, Volume 1". SUNY Press. p. 117. ISBN 9780873957274. ^ "ANNEX II (8)". Dahd.nic.in. 30 August 1976. Archived from the original on 9 November 2014. Retrieved 13 November 2011. ^ Tadeusz, Margul (1968). "Present Day Worship Of The Cow In India". ATLA Religion Database with ATLASerials. Numen. 15 (1): 63–80. ^ "Injured cow in Nepal is serious matter". Yahoo! News. Retrieved 19 January 2016. ^ Jolly, Joanna (24 November 2009). "Devotees flock to Nepal animal sacrifice festival". BBC. Retrieved 24 November 2009. ^ "Over 20,000 buffaloes slaughtered in Gadhimai festival". NepalNews.com. 25 November 2009. Archived from the original on 1 July 2014. Retrieved 25 November 2009. ^ Ram Chandra, Shah. "Gadhimai Temple Trust Chairman, Mr Ram Chandra Shah, on the decision to stop holding animal sacrifices during the Gadhimai festival:" (PDF). Humane Society International. Retrieved 29 July 2015. ^ a b Devendra,, C.; Devendra, C.; Thomas, D.; Jabbar, M.A. ; Kudo, H.; Thomas, D.; Jabbar, M.A. ; Kudo, H. Improvement of livestock production in crop-animal systems in rainfed agro-ecological zones of South-East Asia. ILRI. p. 33. ^ Gesteland, Richard R.; Georg F. Seyk (2002). Marketing across cultures in Asia. Copenhagen Business School Press DK. p. 156. ISBN 978-87-630-0094-9. ^ U Khin Win (1991). A century of rice improvement in Burma. International Rice Research Institute. pp. 27, 44. ISBN 978-971-22-0024-3. ^ Simoons, Frederick J. (1994). Eat not this flesh: food avoidances from prehistory to the present. Univ of Wisconsin Press. p. 120. ISBN 978-0-299-14254-4. ^ Spiro, Melford (1982). Buddhism and society: a great tradition and its Burmese vicissitudes. University of California Press. p. 46. ISBN 0-520-04672-2. ^ Hardiman, John Percy (1900). Gazetteer of Upper Burma and the Shan States. 2. Government of Burma. pp. 93–94. ^ King, Winston L. (2001). In the hope of Nibbana: the ethics of Theravada Buddhism. 2. Pariyatti. p. 295. ISBN 978-1-928706-08-3. ^ Katz, Paul R. (2008). Divine justice: religion and the development of Chinese legal culture. Academia Sinica on East Asia. Taylor & Francis US. p. 56. ISBN 978-0-415-44345-6. ^ Hutton, Wendy (2007). Singapore food. Marshall Cavendish. p. 144. ISBN 978-981-261-321-9. ^ a b c d Sterckx, Roel (2005). Of tripod and palate: food, politics and religion in traditional China – Chapter 11, The Beef Taboo and the Sacrificial Structure of Late Imperial Chinese Society, Vincent Goossaert. Macmillan. pp. 237–248. ISBN 978-1-4039-6337-6. ^ Elverskog, Johan (2010). Buddhism and Islam on the Silk Road. University of Pennsylvania Press. p. 240. ISBN 978-0-8122-4237-9. ^ a b Cwiertka, Katarzyna Joanna (2006). Modern Japanese cuisine: food, power, and national identity. Reaktion Books. ISBN 978-1-86189-298-0. ^ a b c Lien, Marianne E.; Brigitte Nerlich (2004). The politics of food. Berg. pp. 125–127. ISBN 978-1-85973-853-5. ^ "Wearing Shoes – Mourning Observances of Shiva and Sheloshim". Chabad.org. Retrieved 20 October 2009. Wikimedia Commons has media related to Sacred cows.